Ford and the Foutz Motorsports team have joined forces to prepare the all-new 2017 F-150 Raptor for the Baja 1000, but with the standard model already being a very competent off roader, the race-spec version hasn’t actually gone through a lot of changes. 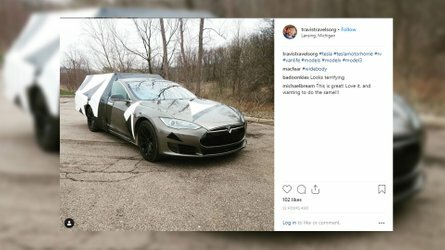 As a matter of fact, the only modifications are a safety cage, racing seats, puncture-resistant fuel cell, along with a full race harness and LED lighting. It still has the stock springs and shocks, but these had to be modified to cope with an increase in weight caused by the new kit installed. 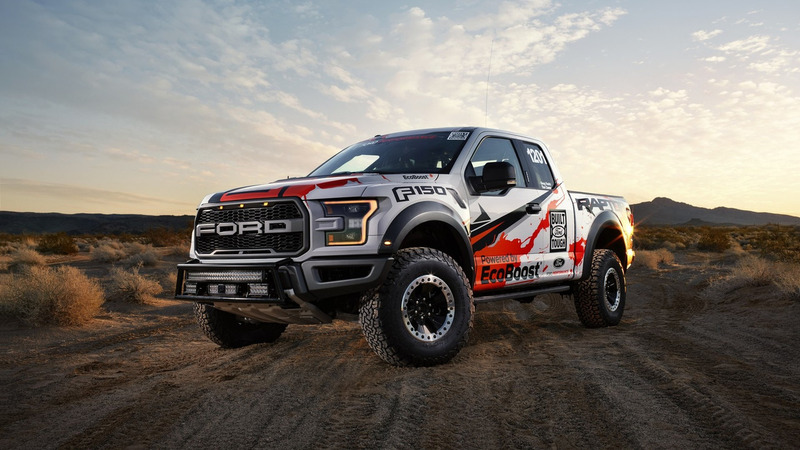 Four-time Baja 1000 winner Greg Foutz will be behind the wheel of the F-150 Raptor powered by the stock 3.5-liter EcoBoost V6 delivering 450 horsepower (335 kilowatts) and 510 pound-feet (691 Newton-meters) of torque delivered via a ten-speed automatic transmission. 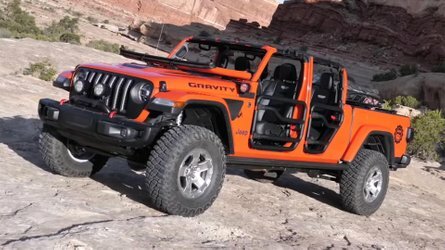 Also taken from the regular model are the wheels and BFGoodrich K02 tires, along with the four-wheel-drive system with a torque-on-demand transfer case. 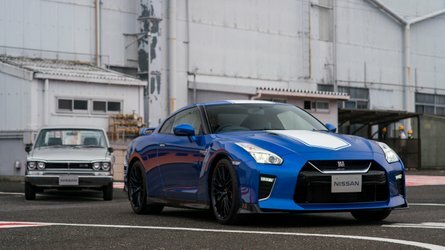 It even has its own Baja Mode, which upon activation will enable faster gear shifts and will also sharpen up the throttle response. It also locks the transmission into high-ratio four-wheel drive, while the Advance Trac traction/stability intervenes less. The feature is part of a six-mode Terrain Management System also including Normal, Sport, Weather, Mud/Sand, and Rock Crawl. 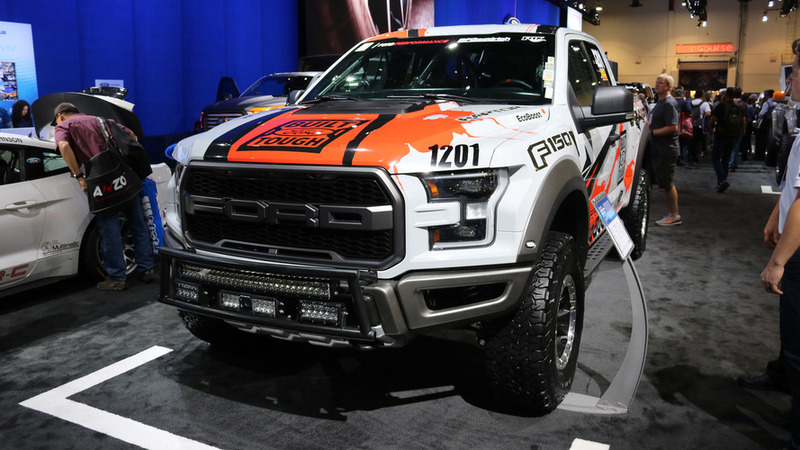 Ford will have the barely modified F-150 Raptor on display at SEMA starting today until Friday, ahead of the truck’s entry in the Baja 1000’s stock full class competition on November 16. 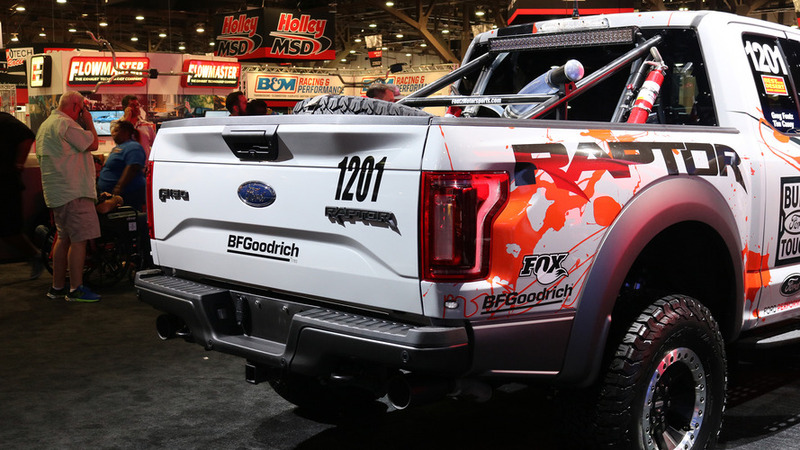 Foutz is very confident in the vehicle's capabilities and says the new version is better in just about every way than the original F-150 Raptor, which he raced back in 2008 at Baja. 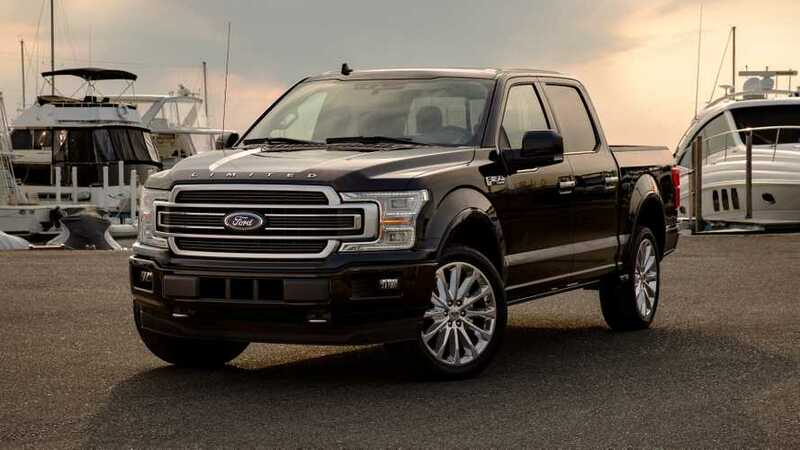 The Blue Oval company hasn’t released exact pricing details so far for the stock 2017 F-150 Raptor, but a leaked ordering guide of the wild truck has revealed the SuperCab body style will cost from $49,520 whereas the more practical SuperCrew will kick off at $52,505. Ford, America’s truck leader for nearly 40 years, will enter its all-new 2017 F-150 Raptor in the 49th running of the SCORE Baja 1000 off-road endurance event, Nov. 16-20. Four-time Baja 1000 winner Greg Foutz will pilot the truck. Ahead of the race, the Ford Performance-supported F-150 Raptor will be on display at the 2016 SEMA show, Nov. 1-4. 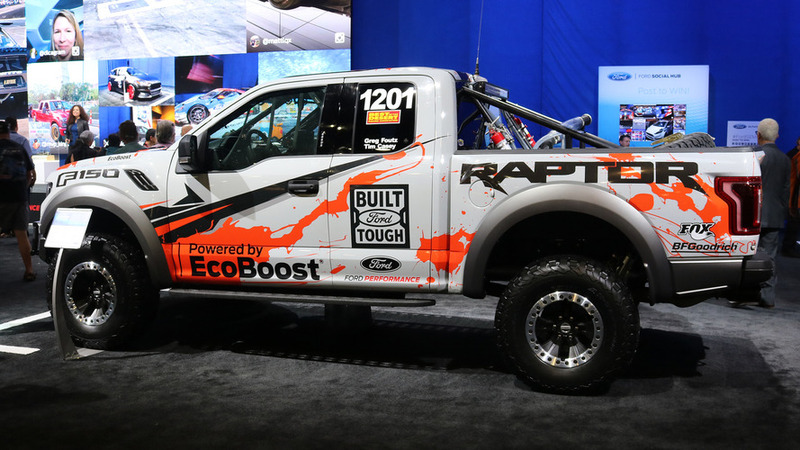 Powered by an all-new high-output 3.5-liter EcoBoost® V6 engine that delivers 450 horsepower and 510 lb.-ft. of torque, the Baja-bound F-150 Raptor race truck showcases the level of performance this purpose-built off-road vehicle will offer straight from the showroom floor. Given the truck’s unmatched all-terrain, all-condition capabilities, the Foutz Motorsports team only had to add a chromalloy steel safety cage, puncture-resistant fuel cell, racing seats and full race harness, along with LED lighting courtesy of Rigid Industries to meet SCORE rules. The factory-spec Raptor springs and Fox Racing shocks were revised to accommodate the added weight from the safety cage and fuel cell. Foutz has run the new Raptor in several Best in the Desert events in 2016, including the most recent 645-mile General Tire Vegas to Reno race in August, which he completed in 15 hours. 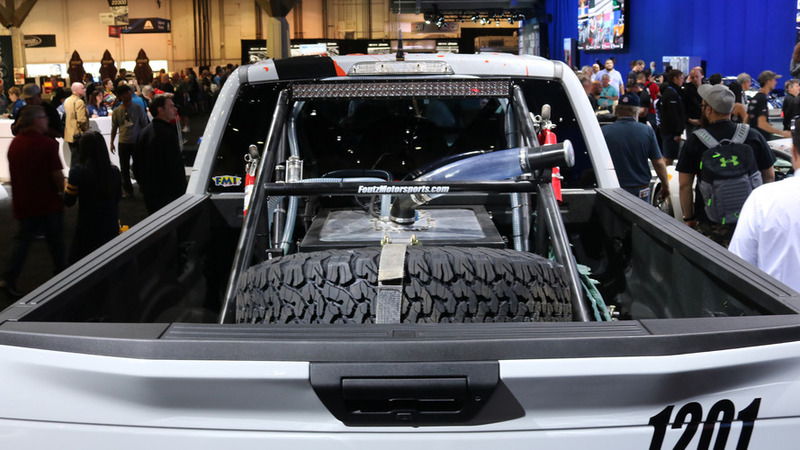 Other production vehicle updates that carry over to the race truck include the high-strength, military-grade, aluminum-alloy body and high-strength steel frame, all-new six-mode Terrain Management System™ and advanced four-wheel-drive torque-on-demand transfer case. 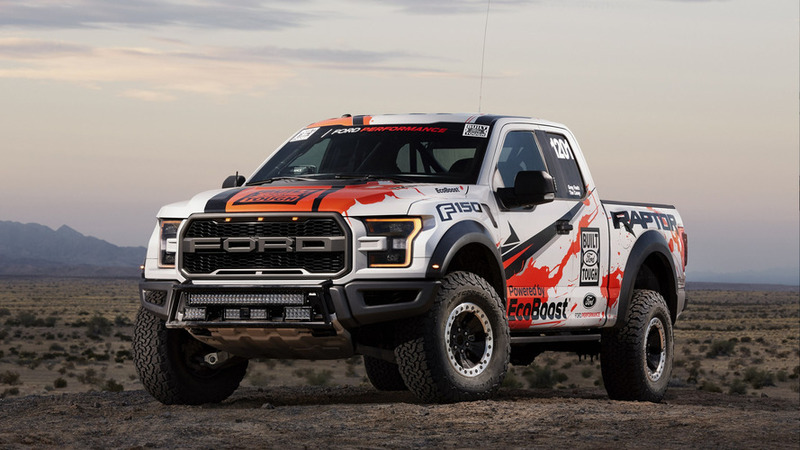 Along with running its first-generation Raptor in the grueling desert endurance race in Mexico, Ford’s long history at Baja includes racing its F-Series Super Duty as well. Ford Performance engineers use the race truck program as a platform to share technology and prove out their trucks in the real world. Jamal Hameedi, Ford Performance chief engineer, says the testing helps to create exciting products that not only perform, but deliver Built Ford Tough capability and durability. “We take what we learn in off-road competition with a factory stock truck to further refine our design and engineering attributes,” he says. Set to deliver 12 new vehicles by 2020, Ford Performance leverages its racing efforts and expertise to speed innovations on dedicated performance models and performance parts. The group works to quickly iterate the latest technologies that can ultimately be applied across Ford Motor Company’s entire passenger vehicle lineup. The performance segment is a growing business for Ford, as the company recognizes a customer desire for vehicles that offer excellent fuel economy, leading technology and a great driving experience. 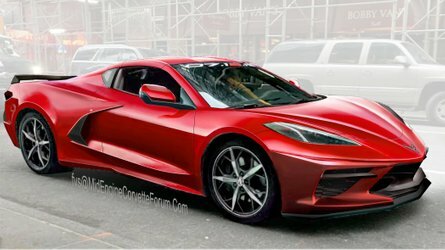 Along with F-150 Raptor, the Ford Performance lineup includes the Ford GT supercar, Shelby GT350 and Shelby GT350R Mustangs, Focus RS, Focus ST and Fiesta ST.